Saturn's largest moon may have active ice volcanoes that spew ammonia and methane instead of lava, scientists say. 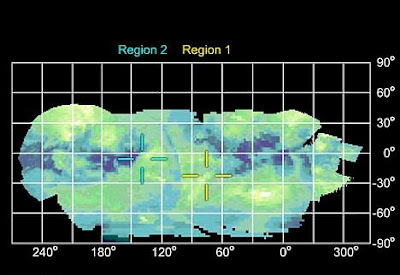 The international Cassini spacecraft took radar images that point recent to liquid flows on the surface of Titan. The findings suggest the moon could contain active 'Cryovolcanoes', or icy volcanoes. Rosaly Lopes, a Cassini radar team scientist, said: 'Cryovolcanoes are some of the most intriguing features in the solar system. Previous flybys and a probe sent to the surface in 2005 suggested ice volcanoes once existed on the moon. 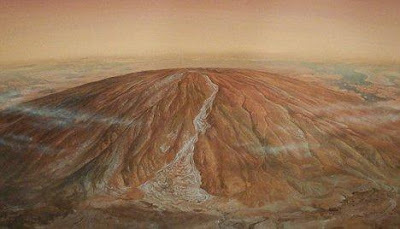 But the latest data 'not only indicate that cryovolcanism has been going on on Titan in the recent geologic past, but might even be going on on Titan today,' Cassini scientist Jonathan Lunine from Arizona University said. Titan is one of the few bodies in the solar system with a significant atmosphere. Scientists believe methane gas breaks up in the atmosphere and forms clouds that rain methane. The source of the methane remains a mystery. Scientists favouring the volcanic theory say methane eruptions from Titan's interior could explain the moon's smoggy atmosphere. 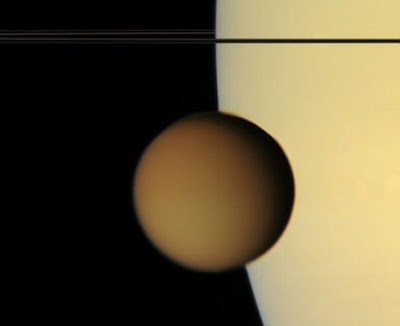 Data from the spectrometer instrument on Cassini found bright spots on two regions on Titan. In one of the regions, scientists found evidence of ammonia frost that they interpreted as coming from the interior. The results were presented at an American Geophysical Union meeting in San Francisco but not everyone is convinced by the evidence. Planetary scientist Jeff Moore of NASA's Ames Research Center said the results were intriguing, but inconclusive. 'Something is going on. Exactly what it is isn't clear,' he said. The Cassini spacecraft has been orbiting Saturn and studying its rings and moons since 2004. 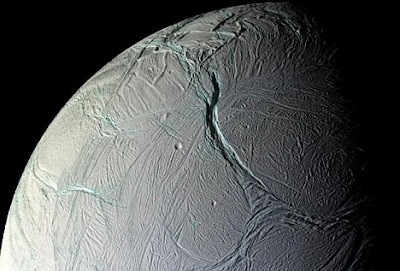 Today NASA revealed the craft had also found evidence of a crust forming on Enceladus. The process, in which the surface splits and spreads apart is similar to that performed on the Earth, and increases the likelihood of a liquid-water sea beneath the surface. New crusts on Enceladus are created by 'tiger stripes', cracks similar to those that split mid-ocean ridges on our own planet. Dr Paul Helfenstein from Cornell University, who worked on the project said: On Enceladus what we see is a type of spreading but it is strongly asymmetric - it's like a conveyor belt.